3. Kick your boots off and slip into these cozy Ugg slippers! 4. Oh so sweet! The coziest sweatshirt for the holiday season. 5. 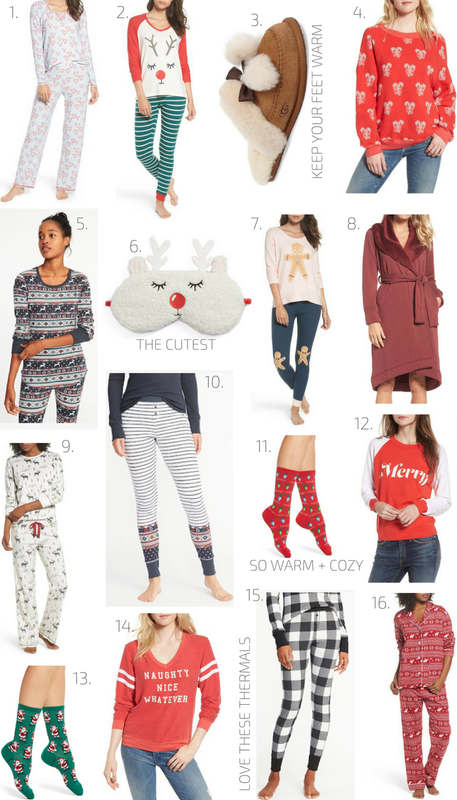 Big heart eyes for all the thermal pajamas this winter! 6. This reindeer eye mask is so adorable and you are guaranteed a good nights sleep. 7. They look yummy enough to eat! How adorable are these gingerbread pajamas?! 8. Slip into these super soft robe after a long day! 9. These fleece pajamas will keep you nice and toasty on those cold winter nights. 10. Striped thermal leggings have been my favorite this season. 11. These Christmas lights socks are so festive and fun! 12. May your day be merry and bright in this ultra soft sweatshirt. 13. Nothing beats the classic Santa socks for the holidays! 14. Naughty or nice?! You decide in this Wildfox sweatshirt. 15. Patterned thermals for the win! These are cozy and oh so cute. 16. Keep it classic in these red flannel pajamas.